Length of agreement can vary from 24 months to 72 months. 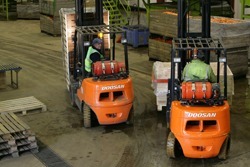 We can supply new or reconditioned forklifts to meet your specific needs, for a fixed price monthly rental cost. The rental will include all the servicing, general maintenance and breakdown costs. Our dealer network has a largest fleet of rental trucks at their disposal, allowing you the opportunity to hire a wide range of top quality forklifts at lower prices. Because rental packages are available with full maintenance included, you can be certain of your total costs, even when you’re uncertain of your future requirements. So whether you are plugging a gap, trialling a new machine or providing temporary cover during maintenance periods – short term rental could be the answer. And don’t forget, all kinds of equipment is available, including gas, diesel and electric forklifts, pallet trucks, reach trucks and attachments. One of the main advantages of short term hire is that companies who have seasonal variations in business level have the option to off-hire with just one week’s notice. Whatever your needs, you can hire your machine over any time period with superb finance and maintenance packages. Please contact our dealers’ rental departments for further information or make an enquiry here.